It turns out the Acqua has a pretty good breakfast, not just barely plated box mall boxes of fauxssaints and long-over-prepped coffee, but good eggs, bacon, two kinds of sausages, fruit that's ripe, a waffle iron to play with, and a woman who can make you lattes. All included in the room rate. Nice. This is day two of our trip up north, if you haven't had your coffee yet to catch up, and today we head out from Mill Valley to hang out at the Point Reyes National Seashore, walk a kajillion steps down to and then back up from a lighthouse, avoid looking a solar eclipse in its infernal eye, discover our motel is a birder's paradise where you learn quail are silly birds (and delicious! ok, we didn't eat any), and a luck upon the finest place to eat oysters until our own stomachs begin to develop pearls. But before all that, before pretty much anything, we are cheesy. 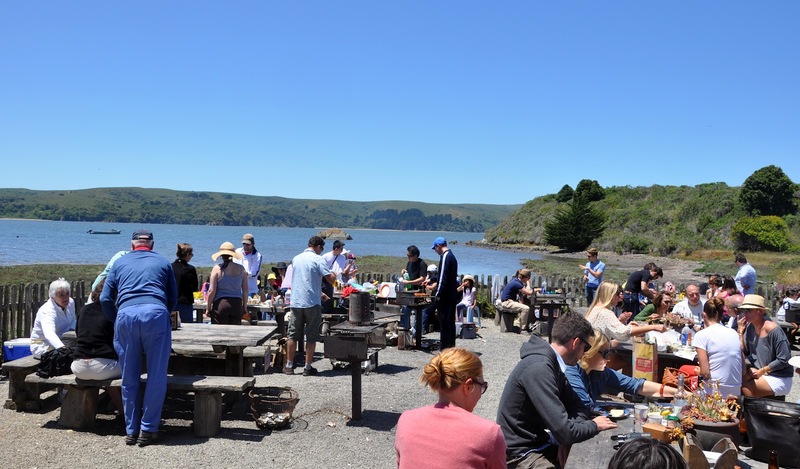 So that means in this neck of the woods, after we get done ahhing and oohing over magnificent Pacific cliffs and rolling dairyland, we need to stop at Cowgirl Creamery in Pt. Reyes Station. 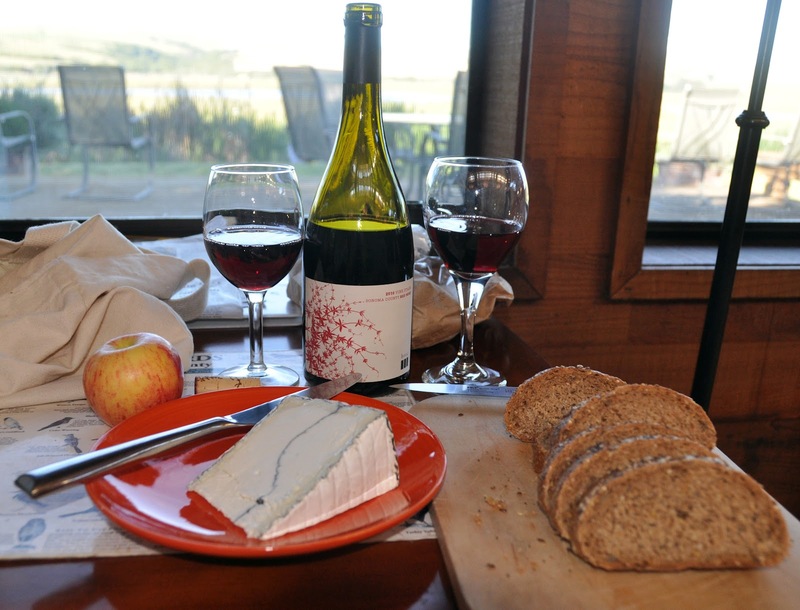 It's hard to imagine the artisan cheese movement without them, and they saved Straus Family Creamery by buying in bulk before the rest of us knew enough to go organic. It's both a bit underwhelming--I guess I pictured a place big enough to host dancing cows in tu-tus--and just right, for it's all about manageable scale, isn't it. They sell their fine cheeses and many of the best of others and have a pleasing little take out counter with salads sold by weight (the fennel and arugula with a bit of a cheese I don't recall grated atop was lovely) and soups and sandwiches, all be-cheesed, of course, if some, like the one we shared (saving room for those pearls we knew we wanted to grow) open-faced so you don't get too carbed out. As snack places go, you could do much worse. After a quick peek about Pt. Reyes Station, which is kind of like an old west town wafted with smelling salts from the nearby bay, we headed out for bivalves. I had a rough idea of where I was headed but had only been this way once years before in the opposite direction, so when we got to an oyster place, we pulled in. Well, we waited, first, for permission to pull in as the parking looked like Dodger Stadium back before everyone hated Frank McCourt. We got a spot and wandered in to what looked like a bay-side, many-grill- and beer-cooler-fueled frat party, but with children, too, and more scary dogs. 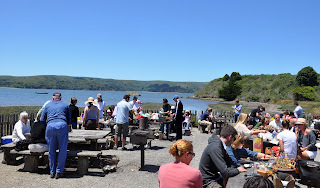 Turns out we were at Tomales Bay Oyster Company, a wilder scene than we were looking for hunting for Hog Island Oysters, which was good enough for Eric Ripert, and we want to be avec Eric. So we forsook our luckily landed parking space and motored further north along the bay, finally finding our destination, which looks like this--better than those drawing of heaven in third grade Catholic school if you ask me, which might be why I don't go to church anymore but love me some oysters. If you want you can reserve ahead of time and drag your cooler in and buy the bushelful and those will come with shucking knives and gloves to help you keep all your fingers. I've shucked a few in my time, but then again, too few to mention, so I have no problem letting the pros do it. Those pros are housed in a boat that's been buried, prow to the sky, as a brilliant re-use shelter, and kindly help everyone through the ordering. But basically it's simple. Tell them to keep the oysters coming. At first we had to stand, but that just gives the oysters, those perfect packets of brine and sweet, sliding down our gullets. 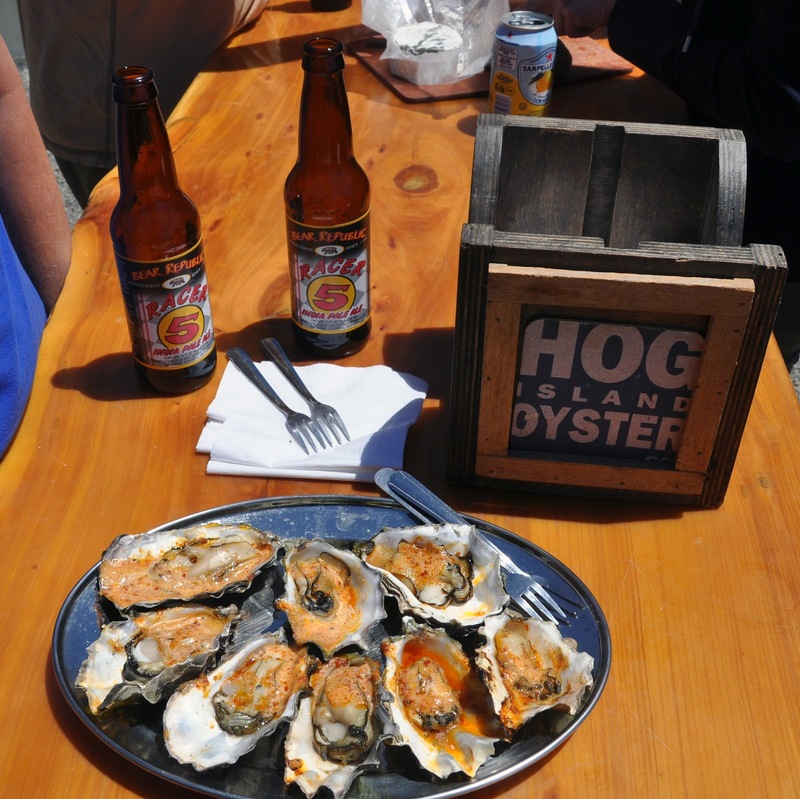 The BBQ oysters at Hog Island might be the best shelled thing I've ever eaten--no doubt fresh as you're looking out at their still cold beds they left perhaps just that morning, then grilled just to the point where they seem they've met heat but haven't melted or worse, toughened, and then laved with a garlic-chipotle butter so good that if Pavlov had it, the saliva from all his dogs would have drowned him. (OK, bad image when I'm trying to say how delicious something was, I know.) You get to wash this down with good micros like Racer 5, and can get bread and cheese and Spanish chorizo from ace purveyor the Fatted Calf, but if you do that, make sure someone wants to help you eat it--these are sharing portions. I guess they figure enough people fight over the oysters, why cause more problems. We did finally leave, only by promising ourselves we'd consider stopping by for early lunch on the way out of town the next day, since we had to loop down around and back up the west side of the bay to get to the Motel Inverness. This isn't a fancy place, and there's barely enough room to swing a chorizo in the standard rooms, but the location is perfect--it even has a catwalk out to a bird-blind right on the bay, and if you get lucky like us, the redwood lodge/lobby will only be visited by two folks checking Facebook on the house computer. That meant we had dinner there after purchasing it at the Palace Market in Pt. Reyes Station, a simple one, since we sort of lunched in two-parts, of locally baked bread, a couple of Fuji apples, a slice of Humboldt Fog (we weren't going to get all the way to Humboldt, so might as well meet and greet it in our bellies--plus that ash line is such a delightful design element, isn't it? ), and a bottle of Broc Vine Starr Red. The wine is lighter than most predominantly zin-based (95%) wines, but we weren't really looking for heavy, just some good berry-ness and enough acid to cut the creamy richness of the goat cheese. It's meals like these that make you go--ah, yes, this is a vacation. And then we had a giant stone hearth with a roaring fire and a pool table all to ourselves. That last part is best for everyone, as it saved you all much laughter.